Prints and previews drawings to plotters and files through a dialog box. Note: When a selection set is active upon starting this command, the selection set is printed. Click Preview to preview the plot on simulated paper. Click Apply to apply the changes. Click Print to print the drawing, or click Cancel to close the Print dialog box. Create new page setups; see the PageSetup command. Selects the printer or plotter. The program works with any output device installed on the system, including networked printers, print to file, faxes, and PostScript devices -- as well as predefined printer parameters stored in PC3 files. Opens the printer's Properties dialog box for customizing the printer's parameters and creating PC3 files; see the PlotterManager command. Specifies the size of paper. 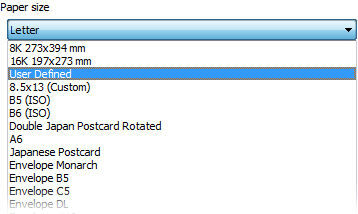 You can select standard sizes listed by the droplist; these are sizes supported by the printer. While printer may appear to support many different sizes, you should select only the size of paper that is actually in the printer. 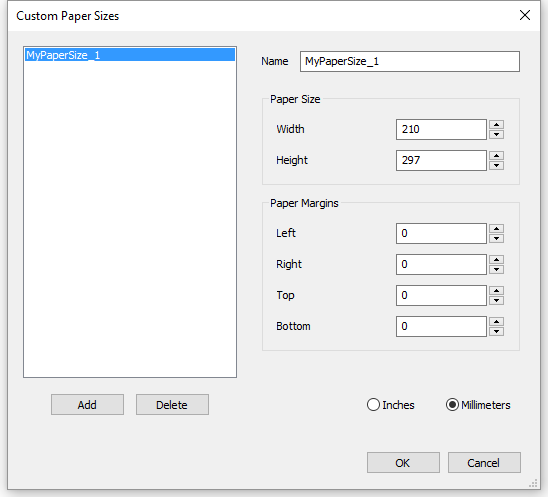 If User Defined appears in the list, the paper's dimensions are specified by the printer's Properties dialog box. The image indicates the size, position and orientation of the current plot area on the selected paper size. View - prints the current view or a named view. Choose a view from the droplist; use the View command to create named views. Extents - prints the extents of the drawing, which ensures every visible entity is printed. Entities on frozen layers are not taken into account when calculating the extents. Limits - prints the limits of the drawing, as specified by the Limits command. Select second corner of window - specify the other corner. Printable area is the size of the paper, minus the margins. Margins are the strips along the four edges that the printer uses for handling the paper. Scale - allows you to specify the scale factor to use for plotting; choose a scale factor from the droplist, or choose Custom. The scale factor shown can be edited with the ScaleListEdit command. For scale factors like 1:5, the drawing is printed smaller. For scale factors like 5:1, the drawing is printed larger. Scale lineweights - when on, lineweights are scaled with respect to the plot scale. Specifies the plot style table to use for the printed output, which assigns properties to "pens," colors, and entities. When the drawing does not use plot styles, then only CTB (color-based table) files are listed. When the drawing uses plot styles, then only STB (style-based table) files are listed. Yes - assigns the CTB or STB plot style file to all layouts. No - assigns the plot style file to the current layout only. Opens the Plot Style Table editor dialog box; see the PlotStyle command. This button is available only when the drawing uses STB plot styles. Creates new plot styles; runs the Add Plot Style Table wizard; see the StylesManager command. When the drawing does not use named plot styles, then the wizard creates new color-dependent tables (CTB files). If the drawing uses named plot styles, then the wizard creates new named plot style tables (STB files). Portrait - The drawing or layout x-axis is aligned with the shortest edge of the selected paper size. Landscape - The drawing or layout x-axis is aligned with the longest edge of the selected paper size. Print upside down - Prints the drawing upside-down. This is useful when paper with a drawing border is loaded backwards in the printer. Specifies the offset distance for the print. Center On Page - centers the print on the page, taking into account margins. Together with Fit Print Area to Size of Page, this option is excellent for prints where scale is unimportant. Positive values - moves the drawing up and to the right. Negative values - moves the drawing down and to the left. The lower left corner of the drawing is moved by the specified distance. This is useful when the paper has a title block area that might interfere with the drawing. On - mimics lineweights assigned to the drawing in the print. On - uses plot styles to determine the look of the printed drawing, and overrides lineweight settings. Off - does not use plot styles. Plot Transparencies - plots entities who have been assigned the the Transparency property, either by-entity or by layer. On - prints model space entities, followed by paper space entities. Off - prints paper space entities first, followed by entities in model space. Hide Paperspace Entities - when on, removes hidden lines from 3D entities in paper space. This option is disabled when printing model space. On - applies plot stamp data to the print. Off - does not apply plot stamps. Save Changes to Layout - determines if the options you changed in this dialog box are saved; the next time you use this dialog box, you can select "Layout" from the Use Plot Settings From droplist. On - saves changes made to this dialog box with the layout. Off - does not save changes. Shade Plot - choose a shade style plot the drawing with. 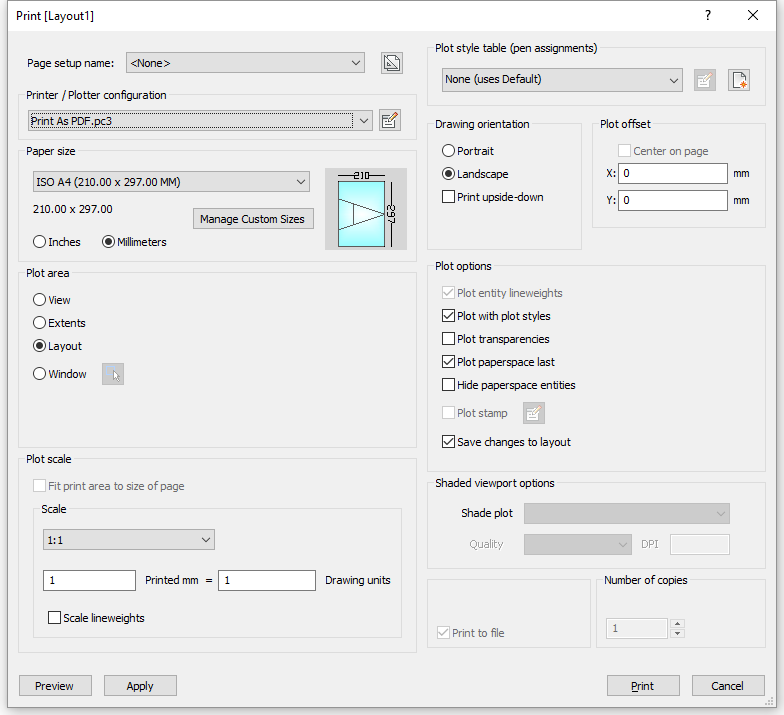 This option is disabled when printing a paper space layout. The Shade Plot mode of a paper space viewport is defined in the Shade Plot property of the viewport. The quality of the Rendered option is defined through the current render preset; see the RenderPresets command. When checked, redirects the print output to a *.plt file, which can be processed by certain types of software. Specifies the number of copies to print. Enter a number or click the buttons to change the value. Displays a preview of the print. In the preview window, click Print Settings button to return to this dialog box. See the Preview command. Applies the changes you made to this dialog box. The changes are remembered the next time you use this command. This is like using the PageSetup command. Returns to the drawing editor without printing the drawing. Plot - plots drawings through the command bar. QPrint - plots drawings using the current settings. Preview - previews drawings before they are plotted. ConvertCtb - converts CTB plot style files to STB files. ConvertPStyles - converts drawings from CTB to STB plot styles. ExportPdf - exports layouts in a drawing to a pdf docucment. Layer - assigns plot styles to layers. PageSetup - assigns plot style to drawings. PlotStyle - sets the current plot style. Properties - changes plot styles assigned to entities. StylesManager - creates and attaches plot styles to drawings. ScaleListEdit - edits the scale list of a drawing, used in Plot Scale section of the Print and Page Setup dialogs and the Standard scale property of a paper space viewport. Publish - allows to print a sheet list (= a list of model space or paper space layouts). Saves a sheet list to a file. -Publish - prints a saved sheet list (= a list of model space or paper space layouts).